This weekend at the British Championships in Birmingham, athletes will be vying for national championship medals but the titles may be more of an afterthought for many as uppermost in many minds will be securing Olympic selection. The selection process is far from crystal clear but any athlete with two qualifying performances who finishes in the first two places is guaranteed selection for Rio, while there are also European Championships places available. Here we take a look ahead to the action at the Alexander Stadium from Friday to Sunday (June 24-26). For a more in-depth four-page preview see the June 23 edition of AW magazine. Rio standards can be found here. Eight athletes have the 100m standard this summer showing Britain’s strength but also the far from challenging time. Chijindu Ujah tops the rankings. The 200m looks far more competitive with Nethaneel Mitchell-Blake keen to show he can translate his 19.95 US form on to British soil. 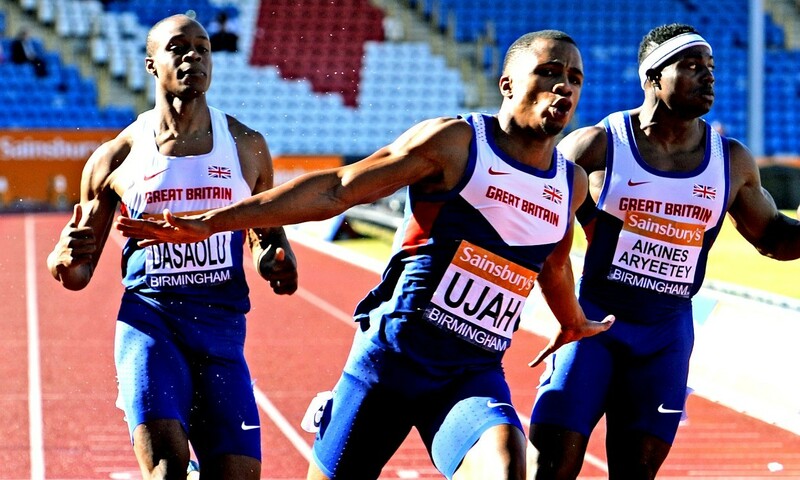 World finalists Zharnel Hughes and Adam Gemili will also want to impress the selectors. Traditionally the 400m has been a highlight of British Olympic trials but this year the event has been of a poor standard with only Matthew Hudson-Smith getting the qualifying mark so far. Multi-champion Michael Rimmer will start favourite for the 800m. Only Chris O’Hare has the tough 1500m standard this summer though defending champion Charlie Grice has it from last year and is clearly in shape to do so again. With Olympic champion Mo Farah not competing, the 5000m would normally be a damp squib but not this year with Andrew Butchart and Jonathan Davies among those set to compete. Rob Mullett has one steeplechase qualifier and will be a clear favourite. The 5000m walk doesn’t have any selection riding on it but Tom Bosworth is the most likely to set a British record at the championships. In-form Andrew Pozzi and 2012 finallist Lawrence Clarke have the high hurdles standard and should make the team. Jack Green and Rhys Williams have the one lap time and look the best placed for Rio. Olympic bronze medallist Robbie Grabarz looks a certain high jump selection as he has returned to his best form. Steve Lewis has experience of clearing the pole vault qualifying height but a lower height will surely suffice for victory. Olympic long jump champion Greg Rutherford is the only qualifier this summer but won’t be competing in Birmingham, while Dan Bramble is also missing the event. In the triple jump, there have been no qualifiers this summer though both defending champion Julian Reid and 2008 Olympian Nathan Douglas made the standard last year. In the shot, Scott Lincoln has greatly improved to 19.59m this summer. The Rio standard isn’t realistic yet but he will surely retain his title. Brett Morse and NCAA champion Nick Percy should provide a good contest in the discus, while Nick Miller is sure to go to Brazil whatever happens in the hammer. Matti Mortimore starts marginal favourite over junior Harry Hughes in the javelin. An 11.32 100m standard is not too challenging and in Ashleigh Nelson’s absence, Desiree Henry and Asha Philip will start as favourites. The 200m will be an even higher standard with Dina Asher-Smith and Jodie Williams focusing on that event for Rio. The 400m looks open. Former Olympic champion Christine Ohuruogu is short of form but, like Perri Shakes-Drayton, should get better race by race. Lynsey Sharp is clearly the class act of the 800m field, while at 1500m, Laura Muir is sure to make the team whatever happens but she will face a strong line-up including Laura Weightman and Hannah England. At 5000m, three athletes have the 15:24 standard and it should be an exciting race between Steph Twell, Eilish McColgan and Laura Whittle. Lennie Waite should be out on her own in the steeplechase after her recent 9:35.91. Bethan Davies should start the favourite for the women’s walk based on her recent PB 3000m and 10km performances. In the 100m hurdles, sisters Tiffany Porter and Cindy Ofili look certain of selection with numerous qualifying marks, while Eilidh Doyle is favourite in the 400m hurdles. With Isobel Pooley out injured, Morgan Lake should win the high jump unchallenged. The pole vault should see Holly Bradshaw confirm Rio selection, while in the long jump, Shara Proctor looks certain to get a Rio spot. In the triple jump, Laura Samuel is another with not too far to find the standard. Rachel Wallader looks set to win the shot, while in the discus Jade Lally should be even more dominant. World hammer finalist Sophie Hitchon is another sure of an Olympic place. In the javelin, Goldie Sayers also stands alone but she will need to add to her single qualifier from last year.